I haven’t thoroughly gone through the Google results and checked every page it came up but here’s one that I’ve referenced to in the guide for the 1st game: http://nekowiki.seesaa.net/article/379857135.html. By the way, I recommend new players to read my guide for Mitchiri Neko Mix for basic gameplay information on how to mix & unlock cats and some other stuff that’s the same in the sequel. 図鑑 literally means picture book. This particular section lets you see what all the obtainable cats look like. 組み合わせ means combinations. It’s the page you want for the list of recipes. バイオリズム is biorhythm. It’s a new (annoying) mechanic added to Mitchiri Neko Mix 2. There are charts for each type of cat listed by day and then time of day. If you need to see what kanji corresponds to what day in your language, here’s the English Wikipedia link that lists them: http://en.wikipedia.org/wiki/Japanese_calendar#Subdivisions_of_the_month. 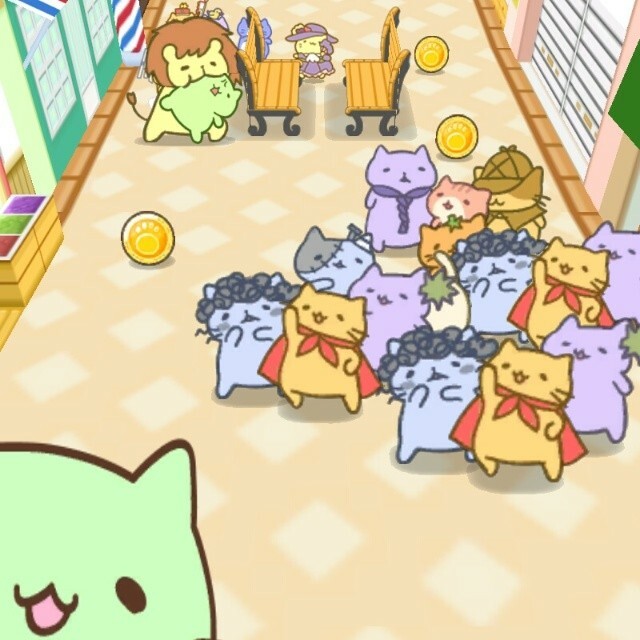 Since I’m not fully literate in Japanese myself and only played a few minutes of the game, it seems like the biorhythm increases the chances of variants spawning as well as upping or lowering the amount of MP (Mix Points) you get for trading in cats for goodies & consumable items in the shop (くろねこ商会). Select the cat so the window for adding cats into/removing cats from the jar shows up. Tap on the yellow paw with 詳細 (or details). If you already have the target cat available, it will show up in the thought balloon with a heart above it. 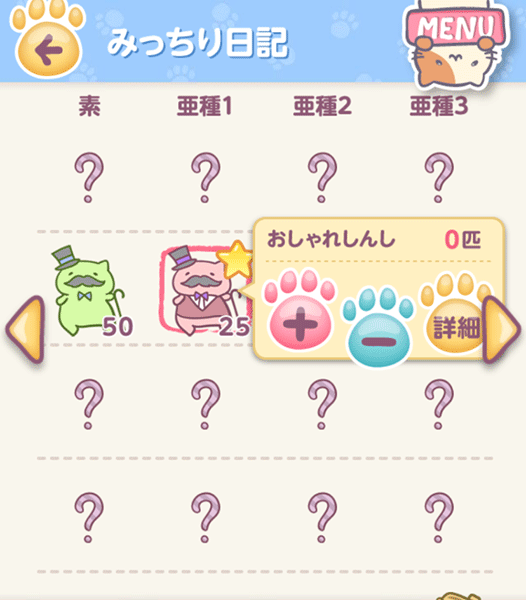 Oh, like the first game, a cat can have more than one breeding partner so it may take a tap or two on the “details” button to see all combinations. 合成のポイント is a page which has a general explanation about mixing. 小ネタ・システム acts like an FAQ. This whole biorhythm gimmick baffles me considering this is a completely FREE game. Adding it in only seems to make things more frustrating for those that want their cats faster (like me)! XD Seriously, I can see this happening in a freemium title where you could purchase premium currency or items with real money to make the critters multiply faster and such. But oddly, Mitchiri Neko Mix games don’t contain ANY in-app purchases so you’re stuck waiting for however long. Granted, there IS an item that reduces reproduction time for 60 minutes/1 hour this time around. (In the shop, check under ねこ缶 (translated loosely as cat food) and choose すぴーど缶 (a.k.a. Speed Food). Anyway, I’m going on a tangent here. Here’s a gameplay tip for users with rooted Android devices. But wait! There’s a DISCLAIMER!!!!!!!! This is by NO MEANS a suggestion. I am also in no way responsible for overheating, bricking devices, reduced battery life, spontaneously combusting devices, etc. In short, should you choose to use this method, it’s because you opted to yourself. 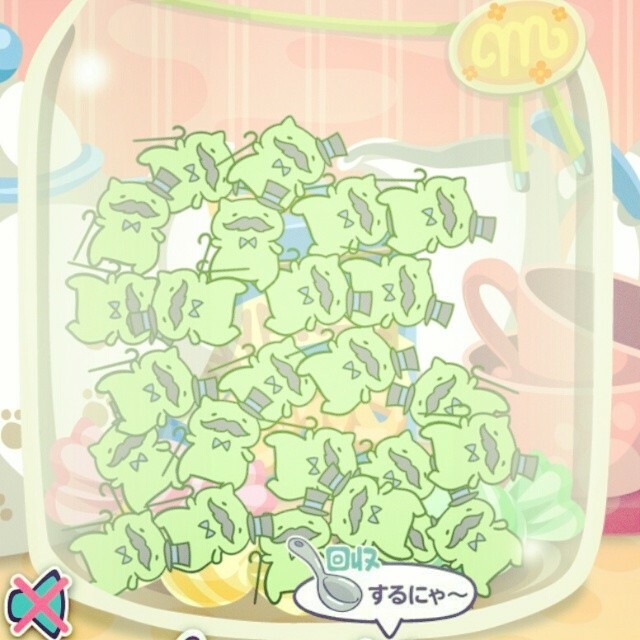 Anyway, there’s an app that can significantly reduce the amount of time it takes for cats to pop up in the mixing jar. However, according to the thread, there are reports that it may not work on certain devices, with certain ROMs, or on certain Android versions. Edit: Actually, my main beef with the Mix games is the waiting aspect since I’m pretty sure the developer could have thought of other, more fun ways for players to mix cats. Waiting reeks of freemium style gameplay which is extremely strange that DC-Archives (the dev) chose to program the game this way. Despite what I ranted about above, I’ve come to realize that with the introduction of the biorhythm gimmick, players actually have increased and faster chances to get new cats & their cousins when compared to Mitchiri Neko Mix. After all, EACH variant has its own biorhythm! This means that there are multiple times in a week and maybe even during the day when you’ll get a star next to one. And with a star comes the information of which partner the selected cat should breed with. We’re no longer completely in the dark … well, maybe except for the secret cats. I love your game guides! My friends and I are still trying to figure out the secret cats. Do you know how to get them? Also, about a month ago (when I had gotten a majority of the cats) I stopped seeing “crushes” in the cat info pages. Have you experienced that and do you know what it means? Im on d 5th page if MNM2. I couldnt breed after that, theres a lot of starred cats but there’s no thought bubble showing which cat they want to breed with. What should i do? Oh man, we’re in the same boat! I sort of gave up after the cats stopped having crushes. I’m traveling to Japan soon for an exchange trip, so I might ask people I meet there for help. The problem is most likely that I couldn’t read some vital instruction. There are a lot of kanji and colloquial phrases in the game that I didn’t understand. I’ll give you an update when I figure it out! The 6th page is for the secret cats. They are basically a crap shoot whether you get them or not because there’s no recipe with guaranteed mix results for those cats. While I am sure that there are recipes that -can- result in the secret cats, I have yet to come across them on the web. So far I have managed to spwan the robot cat (and his respective variations) but none of the other three. 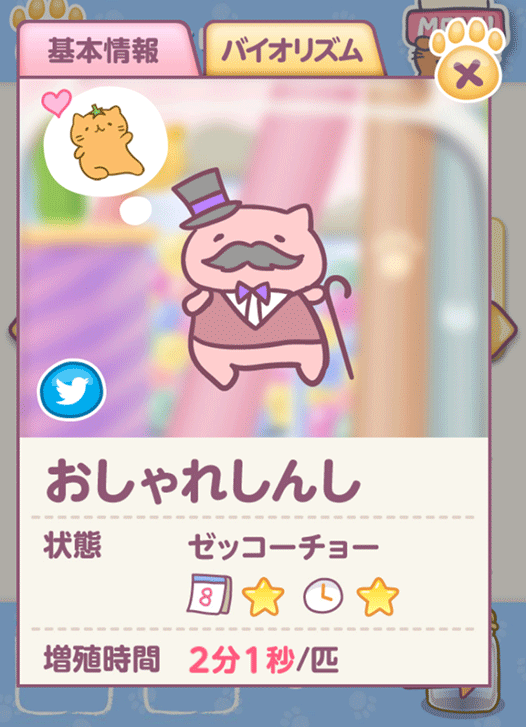 Have you downloaded the latest Mitchiri Neko game? It came out early October apparently, and I don’t know what it’s called but the title ends in “DX.” I have no idea how to play it, because I cannot translate what it says at the strt… 😦 But it looks really fun! Hey uhm, you mention that you could buy a can of food in the shop which boosts the breedings of the cats. But what does the other can that costs 100mp do? Looks like it increases the chances of obtaining variants for 60 minutes. Ah, thanks! I’ll check it out [: any other tips? No, sorry. I don’t play any of the Mitchiri games anymore.